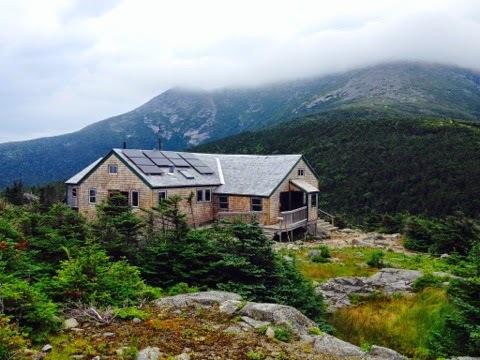 AMC Conditions: Franconia Ridge Adventure! This past week, I had the pleasure of some off time to go hiking on Franconia Ridge with my family. My family does a trip here in the Whites every August. This year was no exception. 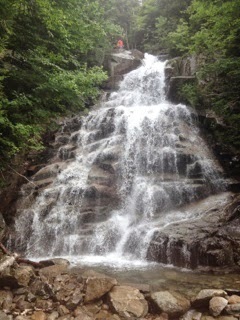 On Wednesday we started out on Falling Waters Trail around 10am heading for ridge line. 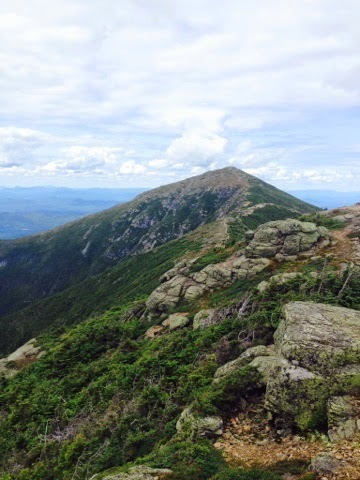 The trail is 3 miles long running from the Old Bridle Path trailhead on Route 93 to the summit of Little Haystack Mountain where the trail intersects the Franconia Ridge Trail. The hike was moderate with some river crossings and areas where the trail was steep and tiring. On the way up we passed AMC's Professional Trail Crew working on the trails. It's thanks to them that we have access to such beautiful parts of the world. They spend all week in the woods repairing and creating trails. After saying farewell and happy trails to them we continued on to a side spur trail to Shining Rock which has an amazing view of Cannon Mountain and the notch. Shining Rock is a huge slab of rock on the side of Little Haystack Mountain over which water constantly flows. In the sunlight it shines as if it were perfectly polished. After Shining Rock, we only had to hike another 20 minutes to get to the ridge. We took a break up there and ate lunch looking down at Franconia Notch on one side and the Pemigewasset Wilderness on the other. After lunch we continued from the summit of Little Haystack along Franconia Ridge Trail to the summits of Lincoln and then later Lafayette. 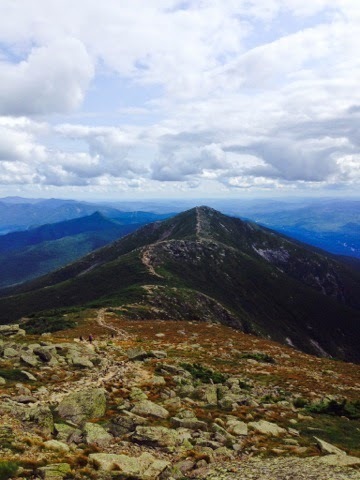 Franconia Ridge, more so than the Presidential Ridge, is a very well defined rock path. Most of the time the trail is lined by small cobblestone-like rocks along the sides. The views on a clear day like we had are incredible. In addition to being able to see for miles in all directions. The mountainsides were every shade of green and the rocks covered in green, white, yellow and red lichens. The 1.7 mile hike from Little Haystack to Lafayette was relatively easy compared to the hike up Falling Waters but there was still a good amount of ups and downs. Once to Lafayette we headed down to on the Greenleaf Trail to Greenleaf Hut for the night. The trail is 1.1 miles to the hut and is relatively steep. After a day of hiking it can be a little rough to go down on tired legs. Once at the Hut, we found our bunks, bundled up and found perfect nooks where we could read and stretch out. The crew made a wonderful dinner for us and helped us celebrate my dad's birthday. After dinner we hiked down the Greenleaf Trail a few minutes to the spur trail for sunset rock. 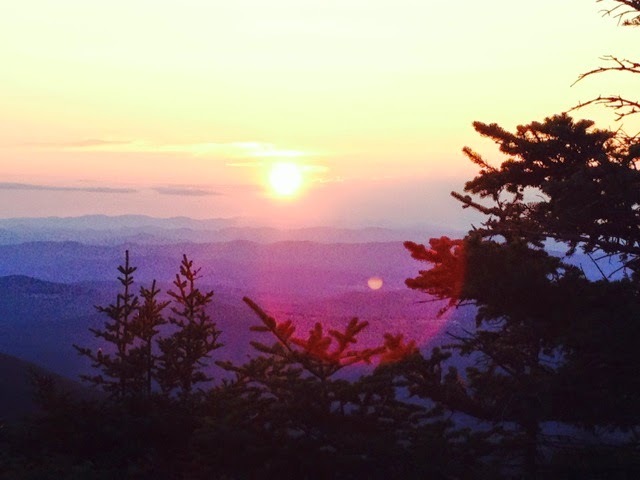 There we all sat and watched the sun disappear behind the miles of blue tinted mountains beyond Cannon Mountain. The next morning we were woken up by one of the crew members, Dave, playing the saxophone. The wake up call at 6:30am is one of my favorite parts of staying in the huts. They are different in every hut and unique to each crew. Sometimes its singing, sometimes a musical instrument, sometimes animal noises! You never know what will welcome you into the next day when you stay at a hut. After eating breakfast we packed up all our things, folded our blankets, tipped the crew, and were off once again. We took the Old Bridle Path which is 2.7 miles from Greenleaf Hut to the trailhead where we started. The trail, very similar to many other trails in the Whites, is rocky and sometimes steep closer to treeline, but smooths out once it reaches a lower elevation. There were a couple of scrambles down jagged, slab-like rock within the mile and a half closest to the hut that I would not have wanted to hike down if it were raining. Other than that, the trail was spectacular. It has quite a few view points just a couple steps off the trail. We often found ourselves stopped looking out over the green slopes of Lincoln, Little Haystack and Liberty. Even with our numerous stops, we still made it down to the parking lot in 3 hours. By the end of our hike we were tired but sad our adventure was over. I know we will be reminiscing about our first family trip to Franconia Ridge for a while. The views were beautiful, the winds low and the sun warm. The company was wonderful, the hut crew entertaining, the mountains welcoming. There's still time to get out there for a couple more adventures before school starts! The mountains are waiting!